Greeneview senior Kenzie Harding splits the Buccaneers defense for an easy layup off a Xenia turnover in the Rams’ first game of the season, Nov. 26 in Jamestown. Xenia freshman Briley Blackburn passes to an open teammate in the Buccaneers’ first game of the high school girls basketball season, Nov. 26, at Greeneview High School. 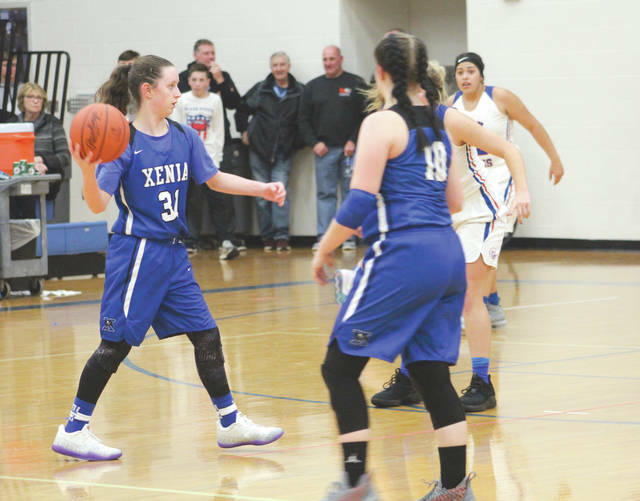 JAMESTOWN — The Greeneview Rams dominated a young Xenia Buccaneers bunch in each team’s first girls high school basketball game of the season by a score of 79-18. The Rams played suffocating defense holding Xenia to just seven points by halftime. Hoelle said his team’s identity is in its defense. He said the kids pride themselves on playing well in the defensive end and feed off of their success there. The Rams offense was looking sharp to open the season as well. Junior Sylvie Sonneman led the team with 22 points and senior Kenzie Harding picked up 19. Sophomore Kamea Baker led Xenia with 10 points. Hand said he is looking forward to seeing his team improve throughout the season as his young kids get some more experience. The Rams (1-0) were never really threatened throughout the game, however there were a few things Hoelle would like to correct going forward. Xenia (0-1) is scheduled to host Greater Western Ohio Conference, American South foe Stebbins at 7:30 p.m. Wednesday, Nov. 28 for its next contest. 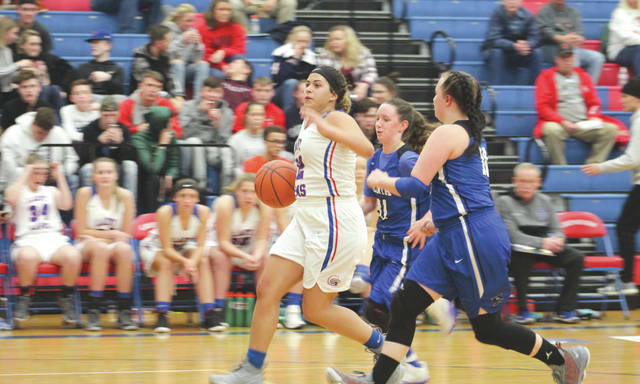 Greeneview heads to South Charleston to begin Ohio Heritage Conference play, at 12:30 p.m. Saturday, Dec. 1 against South Division foe Southeastern.